Americano Intenso Roast and ground coffee. NESCAFE Dolce Gusto Americano Intenso. Transform your mornings! An intense 100% Arabica coffee. Intensity of 9 out of 11 in a long mug (230ml). Roasted coffee aroma, fruity notes and a full body.Transform your mornings with NESCAFÉ® Dolce Gusto® Americano Intenso, a 100% Arabica coffee with an intensity of 9 out of 11. A long intense cup (at 230ml) with roasted coffee aroma, fruity notes reminiscent of black cherry, a full body and a fine crema. 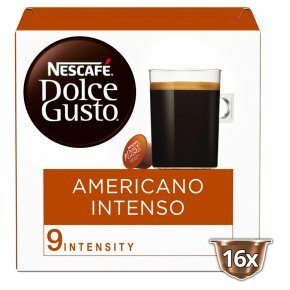 The box contains 16 capsules designed for NESCAFÉ® Dolce Gusto® capsule coffee machines for you to prepare 16 mugs of Americano Intenso. Easy to Prepare Simply slide your Americano Intenso capsule into your NESCAFÉ® Dolce Gusto® machine. Your coffee will be ready right away.